About Nine people have been killed and 24 others sustained various degrees of injuries when early morning twin bomb explosions rocked Maiduguri, the Borno state capital on Saturday. A spokesman for the National Emergency Management Agency (NEMA) Mr Sani Datti confirmed yesterday that Nine persons lost their lives while the 24 persons injured were evacuated to various Hospitals from the two scene of the explosions. According to a member of Civilian JTF attached to the popular Bakassi IDPS camp, Abubakar Tijani ,the first blast occurred when a young man strapped with explosive device who disguised as woman stormed at Civilian JTF check point attached to the Bakassi IDPs camp blew up self along with 5 IDPS while the second blast which occurred at the front of NNPC Depot killed the tricycle ride and 2 female including a suspected female bomber . Also confirming the incident, the Acting General Officer Commanding (GOC) 7 division of the Nigerian Army, Brig Gen Victor Ezugwu and the Borno state commissioner of police , Mr Damian chukwu said the incident occurred at about 7.05am Saturday morning simultaneously at the entrance of Bakassi Internally Displaced Persons (IDPs) camp and NNPC Mega Filling Station, Damboa Road, Maiduguri. At the Bakassi IDPs camp, a suspected female suicide bomber ran into group of men and women at the entrance while they were coming out of the camp, killing 6 people including the suicide bomber and injured 24 persons. At the NNPC, a female suicide bomber followed a fuel tanker in Keke NAPEP tricycle with the sole aim of gaining entry to cause maximum damage and casualty but was prevented from gaining access to the station by another vehicle. 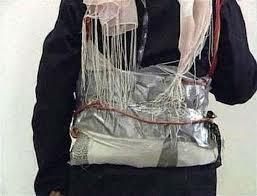 In that process, the suicide bomber exploded killing the 3 occupants of the tricycle. No reported injured persons at this instance.